In Chaps. 9, 10, and 11 we turn our attention to the mathematical background of the geophysical results. In Chap. 9, we show that the systems of partial differential equations (PDEs) applied by us for description of the seismo-electromagnetic interaction during preparation of earthquakes, being without a type according to classical typing of differential equations in mathematical physics, are not something rare and exotic, because systems of equations with a similar structure are used in different domains of physics when nonstationary interactions of physical fields of different natures are investigated. The general structure of these systems is described in Sect. 9.1 and may be characterized as coupling of the hyperbolic and parabolic subsystems by the operators of interaction of the physical fields of different natures that are activated during the earthquake preparation process. In Sects. 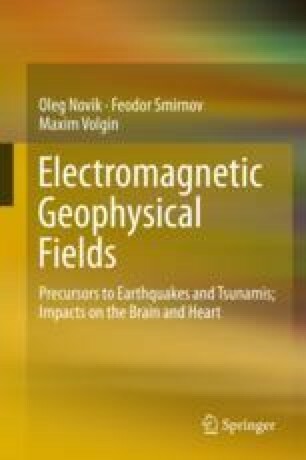 9.2–9.5, we describe examples of similar systems of PDEs applied in physics (including geophysics of seismically active regions) according to different assumptions about the properties of the nonideal (from the rheological viewpoint) geological medium under consideration (e.g., anisotropy, “memory” in the case of magneto-thermo-viscoelasticity, etc.). Feynman, R. P., Leighton, R. B., & Sands, M. (2005). Feynman lectures on physics. Boston: Addison–Wesley. http://www.feynmanlectures.caltech.edu. Accessed 08 Jan 2019. Nemeth, M. D. (2011). An in-depth tutorial on constitutive equations for anisotropic materials (p. 582). NASA/TM-2011-217314. http://www.sti.nasa.gov. Accessed 08 Jan 2019.